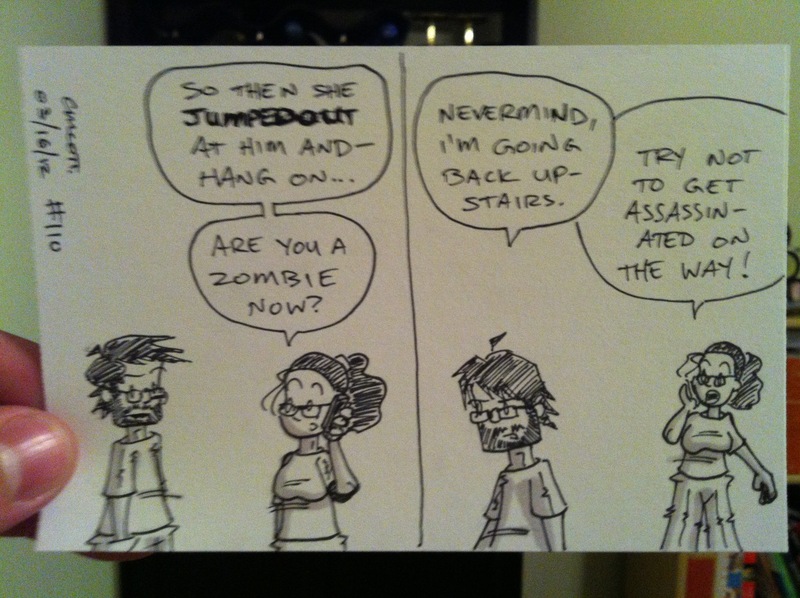 Felt confident enough tonight to do an actual comic rather than just a sketch. 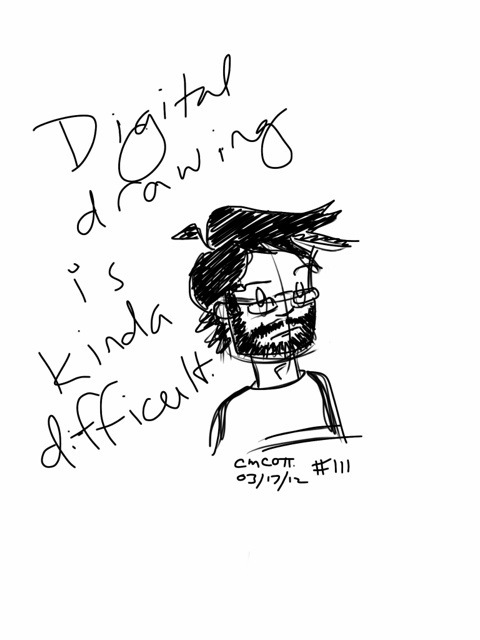 Not sure if my process is faster or slower using the iPad yet. 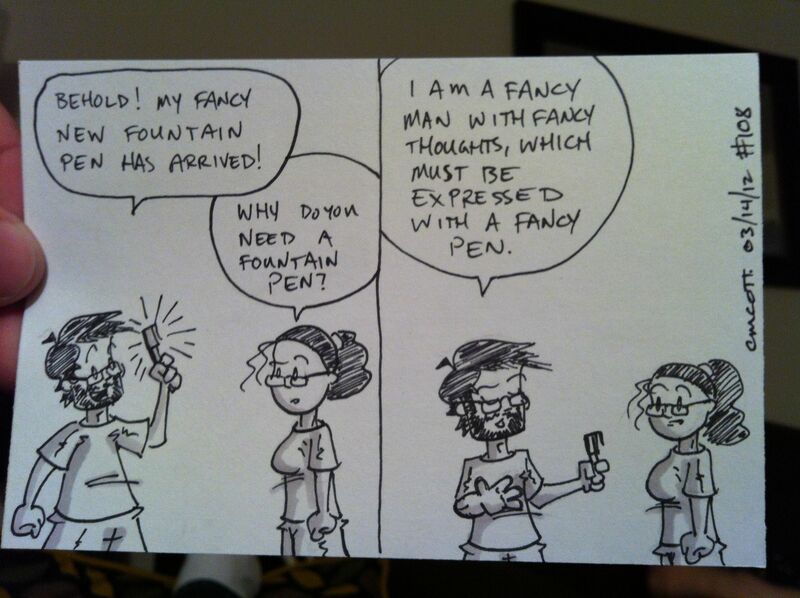 I do know my handwriting is pretty horrible on this thing, though. That’s my biggest complaint about the sketch program I’m using: haven’t been able to figure out if I can add text to it, or if I’d be able to find a text for it that doesn’t look like crap. More digital sketching. Starting to get it figured out. I’m still playing around with the sketching program on the iPad. Drawing larger is definitely making it easier, and I think I’m starting to get the hang of it. I even tried my hand at some shading to it, which I’m pretty pleased with. 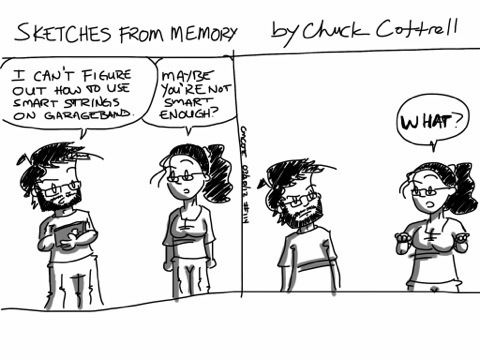 It’ll probably be awhile before I’m ready to do actual comics this way, but it’s definitely coming along. 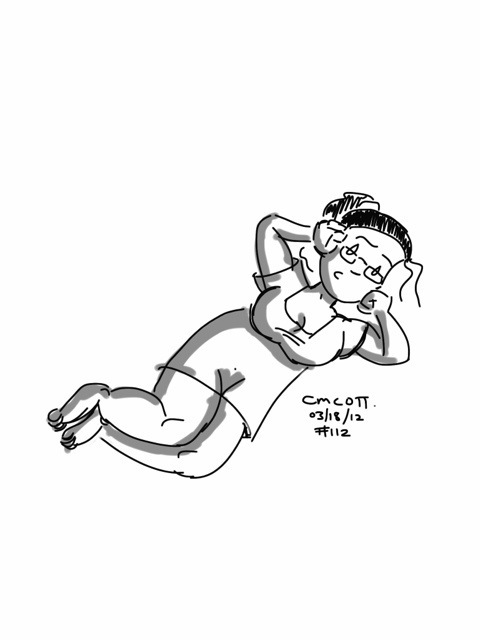 I just hope my wife isn’t mad I drew her while she was on the phone. I’ve been experimenting this morning with my stylus and the Sketchbook Pro iPad app. It’s a pretty neat app, once you get the hang of it. I just have to remember not to rest my hand on the iPad while drawing (I always rest my hand on my drawing surface, so this might pose a challenge). Anyway, you can see some of my sketching efforts above. 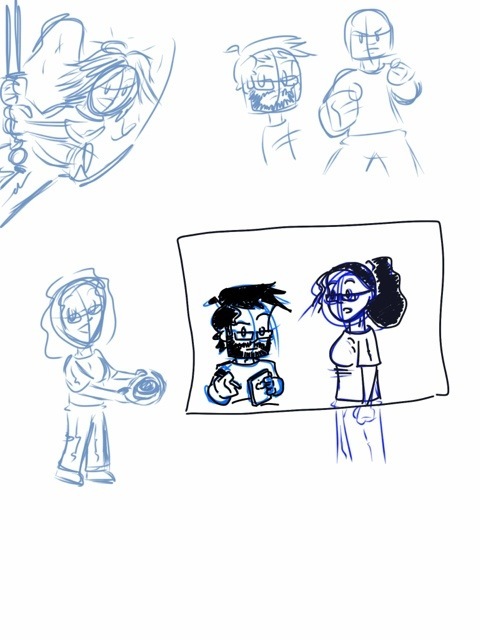 I was working with a blue rough sketch layer and a finished black “inked” layer for a couple of images. Using different colors for each layer is definitely a necessity; I tried doing last night’s sketch just with black for both layers, and it was tremendously difficult to tell what was what. Today, I used some birthday money and some tutoring money and bought myself the new iPad. It’s a pretty amazing piece of technology, I must admit. 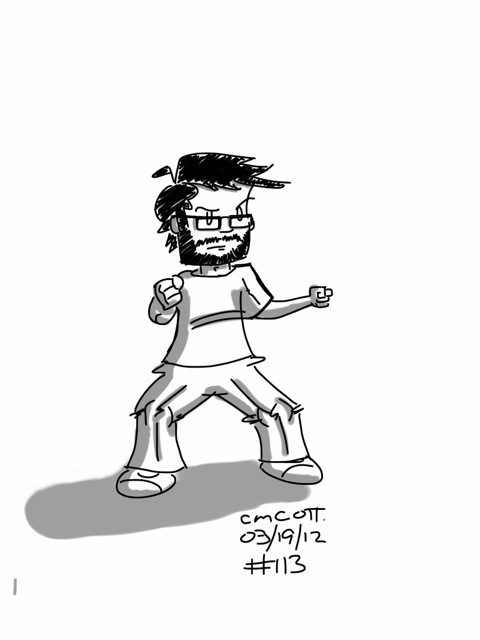 I went ahead and downloaded a sketchbook program so I could try drawing stuff without pen and paper. I like it, though I don’t think it’ll be replacing my usual artistic methods anytime soon. Contrary to popular belief, I did not actually die yesterday. Okay, I did die, but I respawned. 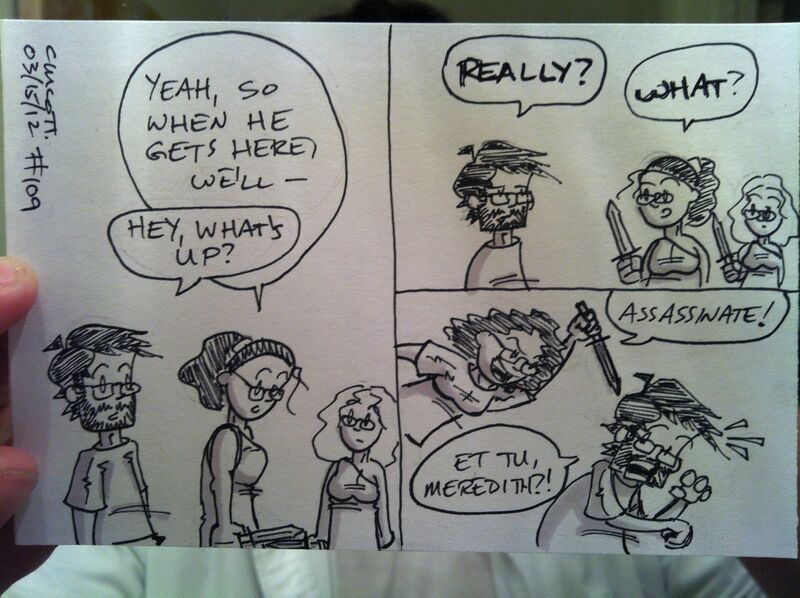 Happy Ides of March, everyone! If a bunch of people ask you to meet them at the Senate tonight, just say no. It’s for the best. 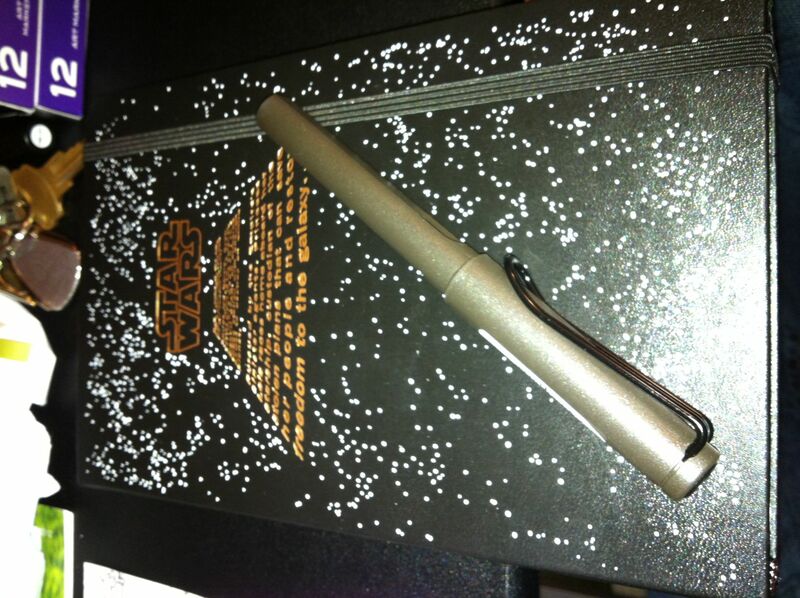 Yes, it’s a Star Wars Moleskine journal! It’s one of the presents my wife got me for my birthday. It is, as you can see, pretty damn awesome. 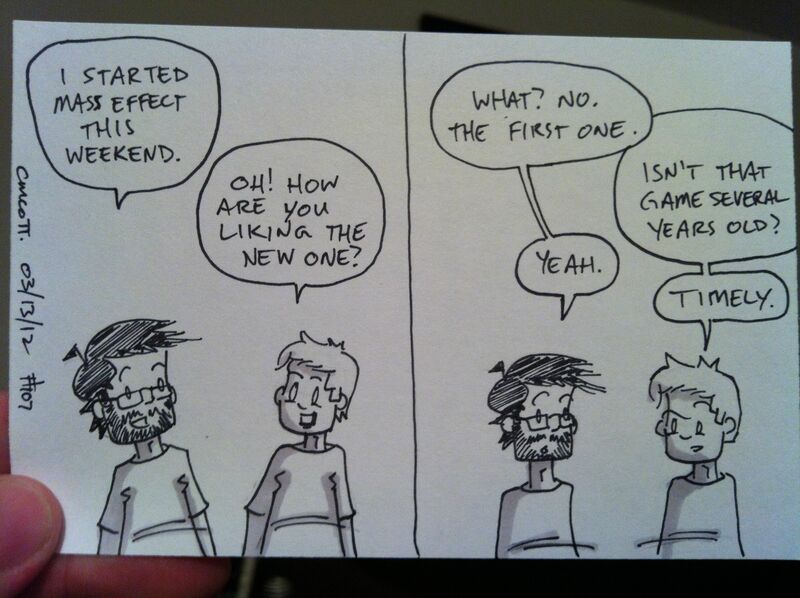 So over the weekend, I began playing the first Mass Effect game. It’s pretty cool so far, though I’m still not real good at shooting people in it. I also think I prefer the fighting system in Dragon Age II (which is basically the same game, only with dragons and swords and stuff instead of Mass Effect’s sci-fi elements). We’ll see if I have the energy and time to invest in completing all three Mass Effect games.